This teapot cake was fashioned from sculpted Rice Krispies and covered in gum paste. 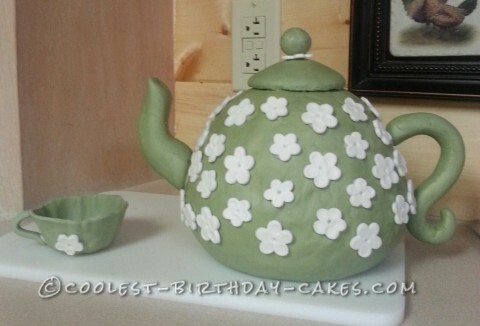 Twenty four teacups were molded from gum paste on the bottom of a cupcake pan. Chocolate cupcakes covered in rich chocolate buttercream icing were then placed in each cup to resemble warm tea along with a swizzle stick to complete the setting at a dear friend’s housewarming party.